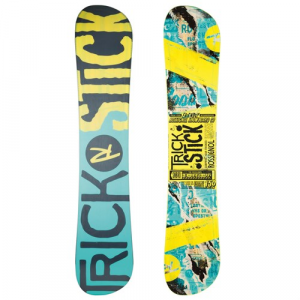 Rossignol Trickstick Amptek Snowboard Deal – 50% Off! September 4, 2016 – The Rossignol Trickstick Amptek Snowboard is a do-it-all freestyle deck. It’s a park killer. Whether you’re spinning or pressing, this true twin has a buttery flex that stays snappy and stable underfoot for an ultimate freestyle experience. The Rossignol Trickstick Amptek Snowboard was one of our favorite all around park boards. Your bag of tricks is going to be deep after a season on the Rossignol Trickstick Amptek Snowboard. With its soft, but not too soft, twin flex and AmpTek Auto Turn shaping, the Trickstick is a forgiving deck for attempting the unthinkable on a rail or box. This jibber’s also reinforced with ABS Sidewalls so you can keep pounding your grinds without seeing your edges getting destroyed. Whether you’re new to the freestyle game or you’ve been buttering knuckles for decades, there is more to explore with the Rossignol Trickstick Amptek Snowboard. AmpTek Auto Turn [80% Rocker / 20% Camber] – Effortless mobility thanks to the easy-riding in all areas and terrain, super nimble in powder, easy edge-to-edge transition. Wood 6420 – Single type of wood that’s vertically laminated to give durability and comfort without chopping down the bank. Glass Fiber – Has greater elongation before breaking than carbon and comes in multiple weights and weavings. Rossignol plays matchmaker, matching each board with the right glass fiber for customized flex and torsional resistance. All Board Insiders deals are handpicked and available at the time of posting. We do not take any money from snowboard companies for doing reviews, so if you enjoy them, please use our links to shop for snowboard gear. Thanks! 6 great snowboards for under $200!